Cost per click (CPC), pay per click (PPC), and search engine marketing (SEM) are some of the names that refer to paid search engine advertising. Paid search is the act of placing sponsored ads at the top, bottom, or side of search engine results pages (SERPs) for your products or services. 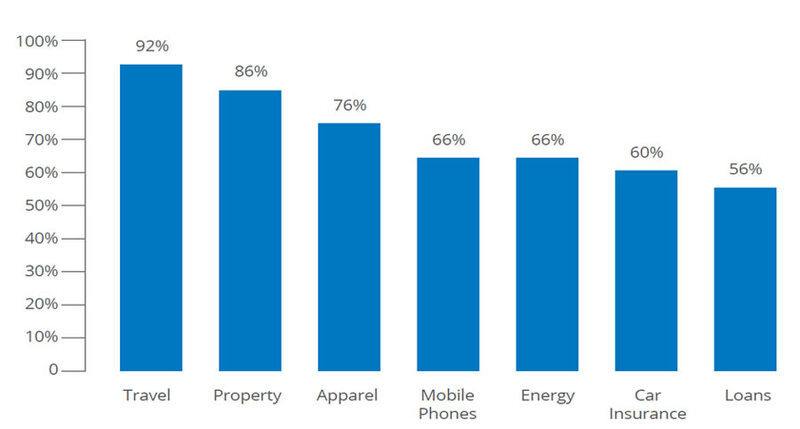 These ad placements will vary by each search engine and device type. Why Should You Use Paid Search? Paid search, in my opinion, is one of the best direct response marketing vehicles. Since a consumer is performing a search using one of the keywords that we’re targeting, we know that they already have an interest in our product or service. We also know that approximately 70% of buyers will use search at some point during their research, which provides marketers with a great opportunity to attract these consumers to their site and hopefully convert them. What separates paid search marketing from other marketing strategies is the fact that it is trackable, measurable, and adaptable. You will know when someone that clicks on your ad winds up landing on your site. 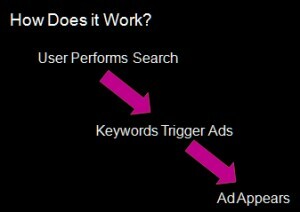 You can even track where they go on your site after your ad is clicked by using Google Analytics. Both Google Adwords and Bing Ads allow you to track visits to your site using analytics. Adwords data automatically imports data into Google Analytics (as long as you enable auto-tagging in your Adwords account), and allows you to see campaign and keyword performance in Google Analytics if you link your Adwords account to your Google Analytics account. You can also import conversion goals from analytics into Adwords, or setup conversion tracking directly in Adwords and/or Bing Ads by placing the provided code onto your website. All conversion data will then show up directly in the interface if a click on your ad leads to a conversion (e.g. sign-up for your whitepaper, download a pdf, make a purchase on your site, etc.). Since you know which ads and keywords are getting clicks and how many conversions you have received from each one, you can then measure how effective each keyword and ad is. You can also segment your campaign performance by time of day, day of week, geographic location or any of a number of other dimensions. The ability to make changes to your ads, keywords and campaigns within minutes by using the measurable data within your account is what makes paid search so adaptable. There are many places where ads can be placed. Here are a list of the ones used most. Google Adwords is the advertising platform for Google that allows businesses to place advertising on the Google search engine as well as the Google Search Network. Search Partners extend the reach of paid search ads to hundreds of non-Google websites such as AOL, Ask.com as well as additional Google sites such as Google Maps. 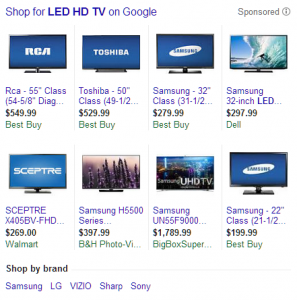 The Google display network is a network of banner/display advertising (i.e. 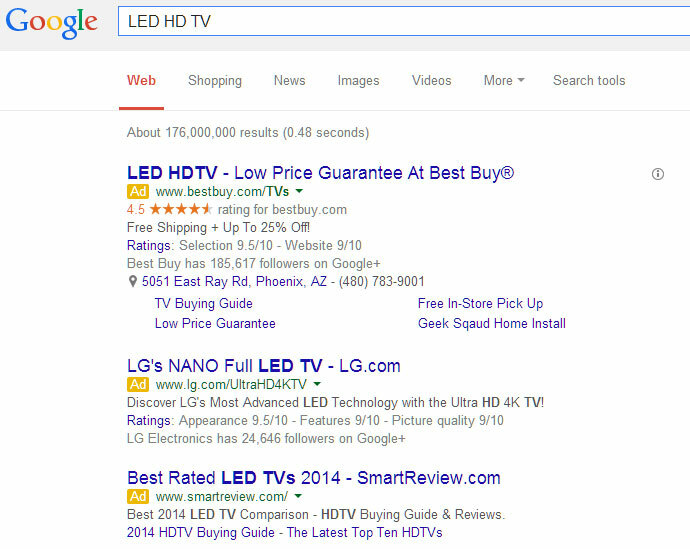 graphic ads as opposed to just text ads) on Google’s network of partner websites. Product listing ads allow you to place images, titles, prices and ad copy next to each product you are advertising for. 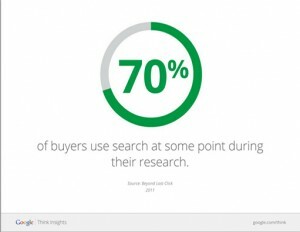 Your ad and product will show up for relevant search results on Google search, search partners and on Google shopping. Adwords Express is Google’s automated advertising platform for small businesses that may not have the time and/or resources available to manage campaigns on the Adwords full service platform. It is easy to use, but lacks the campaign management tools and functions which would allow for truly optimized campaign management. I do not recommend using this unless you have no other choice. Bing ads is the advertising platform that allows businesses to place advertising on Bing, Yahoo and their search partners’ search engine results pages (SERP). In order to start a campaign, you need to get a list of keywords based around your products or services. Once you have created your keyword list, start segmenting them into similar groups according to themes. These groups will translate into the Ad Groups that you will set up. You can then segment your keyword list further into separate campaigns. It is a good idea to separate out different product categories into their own campaigns. Broad match is the default matching option. With broad match, your ad may show if a search term contains your keyword terms in any order, and possibly along with other terms as well. Your ads can also show for close variations of your keywords. I do not recommend using broad match because your keywords will bring in lots of traffic that may not be relevant to the product or service you are trying to advertise. Broad match modifier is similar to broad match, but instead your modified keyword (the keyword you add the plus symbol (+) to) must be included in the search query for your ad to show. By adding a modifier, your ads can only show when someone’s search contains those modified terms, or close variations of the modified terms, in any order. The modifier won’t work with phrase match or exact match keywords. Phrase match places your keyword in quotations, “phrase match.” With phrase match, your ad can show when someone searches for your keywords within the phrase, with additional words before it or with additional words after it. It will not show your ad if the keyword is searched in a different order. We’ll also show your ad when someone searches for close variations of that exact keyword, or with additional words before or after it. Exact match places your keyword in brackets, [exact match]. With exact match, your ads can only appear when someone searches for your exact keyword, and only your exact keyword or close variations of that specific keyword. Close variations can include misspellings, plural and singular forms, as well as a few other common variations of the keyword. Negative match keywords are keywords you do not want your ads to show up for. This allows for more control of when your keywords do and do not show up. You can save your campaigns a significant amount of money by negative matching irrelevant keywords. Each keyword must have a bid associated with it so it can enter a paid search auction to determine where on the SERP it will show up. Bids can be implemented at the Ad Group level or keyword level. Keyword level bids take priority over Ad Group bids, so keep in mind that any keyword bid will override your Ad Group bid. CPC is bidding where you only pay when someone clicks on your ad. This is typically used in paid search advertising. CPM is bidding where you are paying a cost per 1,000 impressions. Essentially, you are paying for your ad to appear on the publisher’s website. This is typically used in display/banner advertising. CPA is bidding for an acquisition (i.e. lead) generated with conversion tracking implemented in your paid search campaigns. You may use CPA bidding to get conversions at the average amount set as your CPA bid. You are still paying per click, but your bids will automatically be set based on conversion history to reach the cost-per-acquisition set. Hi, I’m Hal Varian I’m the Chief Economist here at Google, and today I want to talk with you a bit about how the ad auction works. So to make a successful auction we have to reconcile the interest of three parties, and those parties are the advertiser, the user, and Google. The advertiser wants to show relevant ads so the users click on them, the users want to see relevant ads, they don’t want to be bothered with spam, or other irrelevant material, and Google wants to make a good experience for both the advertisers, and the users so they come back and use our services in the future. Now that we understand the motivation of the players we can look at how their actions are reconciled in the auction. So I’m going to do a very simple example to start with. It’s a case where there are three slots, so three positions where ads can appear, and there’s four bidders who are competing for those slots. What happens is every time a query is made on Google we run an auction, and the auction is an auction for clicks. So advertisers only have to pay when they receive a click. In this particular case, we have our four advertisers with different bids; four, three, two, and one, and the ads are ordered in terms of those bids. Highest bidder gets the first position, second highest bidder the second position, and so on. They don’t have to pay their bid when they receive a click; they only have pay the bid of the advertiser below them. So in this particular case we have the first advertiser bidding $4.00, but they only have to pay $3.00 which is the bid of the second highest advertiser, same thing for advertiser two, and for advertiser three. So this way each advertiser can bid their maximum willingness to pay, but what they have to pay is just enough to beat the competition. So I told you that was a simplified version of the auction, let’s try to do something a little more complicated. What’s left out of the example I just gave was the concept of ad quality. So remember, users want to see relevant ads, advertisers want to present relevant ads to users, and Google wants both users and advertisers to have a good experience, so they come back and continue to use the system. So what we want to, what we’re concerned with at Google is making sure that ads that are shown to users have a high ad quality. So what is quality score? So there are three components to the quality score, the biggest one by far is click through rate. By allowing users to vote with their clicks we have millions of people who are helping us decide which ads are best for each search query. Google’s philosophy has always relied on user feedback as a key driver decision making. So using click through rate, and quality scores is our way of incorporating that feedback into ad serving. Relevancy is the second largest component of quality score. Both the relevancy of the keyword to the ads as well as to the users search query, Google determines relevancy by analyzing the language and contents of an ad or query, and determining how well it relates to keyword. Google uses relevance to make sure that only useful ads are displayed to users, and it prevents advertisers from paying their way onto a search that’s unrelated to their product, or service. The third component of quality score is landing page quality. An ad is only useful to a user if the landing page it leads to help them find information they’re looking for. A high quality landing page should have relevant, original content, be easily navigable with quick load times, a minimum of pop-ups, or pop-unders, and be transparent about the nature of your business, how your site interacts with a visitor’s computer, and how you intend to use a visitor’s personal information. So how does this quality score affect the way the auctions run? What we do is we have a concept of ad rank, and ad rank is going to be the bid of the advertiser times the quality of the ad. So in this particular example I’ve got four advertisers, they’re bidding four, three, two, and one, and the ads have different quality. In this case it’s a quality of one, three, six, and eight, so to determine the ad rank we just multiply those two numbers together. And then what we do is we rank the ads by the ad rank. So the best performing ad here is 12, second best is this ad at 9, third best is this ad and up here the advertisers bidding 4 at such a low quality that it doesn’t get shown at all. So now we know how the ads are ranked, how much do I actually pay for a click? Well we use the same logic as in the simple example I presented a few minutes ago. Namely you pay the minimum amount that’s necessary to retain your position. So think of advertiser in position one, he’s competing with advertiser in position two, and the amount that advertiser one has to pay is determined by, here’s the price he has to pay, here’s the quality of advertiser one, it’s going to be just enough to beat advertiser two who bids B 2, and has quality level Q 2. So if you solve that equation, the price that advertiser one has to pay, his actual CPC is going to be the ad rank of the advertiser below him, divided by the quality score of advertiser one. So let’s see how this works in a slightly more complicated example. Here we’ve got three advertisers, and they’re each bidding the same price. So we’ve got max bid is $4.00 for each of them, but they have different qualities, in this case the quality is eight, six, and three. So the ad rank is determined by multiplying the bid times the quality to give us ad ranks of 3, 32, 24, and 12. So what determines the price? Well the price is going to be the ad rank of the advertiser below divided by the quality score of the given advertiser. So in this particular case it’s going to be 24 divided by 8 or 3. In this case it’s going to be 12 divided by 6, or 2, finally for the last advertiser in this example there’s no advertiser below the last advertiser, so the price this person ends up paying per click is just the minimum that’s determined for that auction. Click-through-rate (CTR) – a rating that shows how well your ad is doing against your competitors’ ads, weighted against your position on the SERP. Ad relevance – how closely related your keyword is to your ad. Landing page experience – how relevant your website’s landing page is to your keyword and ad. So how does this quality score affect the way the auctions run? What we do is we have a concept of ad rank and ad rank is going to be the bid of the advertiser times the quality of the ad. So, in this particular example, I’ve got four advertisers. They’re bidding four, three, two, one and the ads have different quality. In this case it’s a quality of one, three, six, and eight. So, to determine the ad rank, we just multiply those two numbers together. And then what we do is we rank the ads by the ad rank. So, the best performing ad rank is 12. The second best is this ad, nine. The third best is this ad. And up here the advertiser is bidding four at such a low quality that it doesn’t get shown at all. Ad rank determines your ad position on the SERP by calculating your bid amount and your quality score. Paid search is a great choice for lead generation and to drive sales. It should be a part of almost every company’s marketing plan as it can be a great tool to increase revenue and ROI. A paid search campaign will always start with your keywords, so you will need to decide how to segment your keywords into Ad Groups and campaigns, how much to bid on each keyword, and which match types to use for each keyword. You can create the same keyword with different match types, e.g. 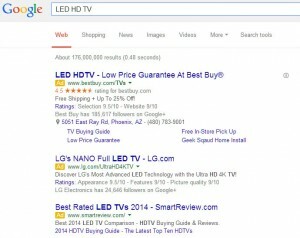 broad match = LED TV, phrase match = “LED TV”, and exact match = [LED TV]. So if you are unsure which match type to use, try different combinations and see how each keyword match type performs. It is important to be able to track performance of your campaign, so remember to setup conversion tracking and analytics. If you are new to paid search, I recommend you start off with a smaller campaign that you can later build upon once you can see sales or leads come in.